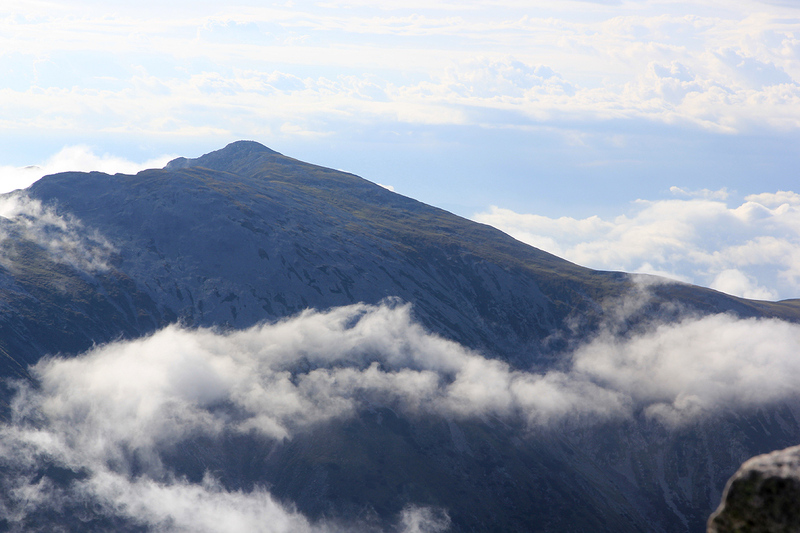 This mountain is located in the first national park of Romania, Retezat National Park. 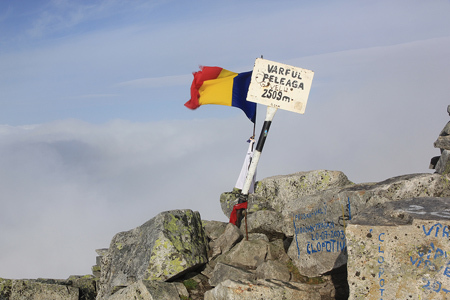 The peak can be climbed from the north, but the closest approach is from a trailhead, Poiana Pelegii, on the south side of the mountain. In order to access this trailhead, first locate the village Hateg. Hateg is located along Hwy. E79/66. Hateg is NW of Petrosani, the main reference point for climbing the mountain Paringul Mare. From Hateg, drive SW on Hwy. 68, approximately 10 kilometer to the small village named Carnesti. look for Hwy. 685, a road going left just after Carnesti. Take this road and follow it for 8.2 kilometer. Measure your distance driven from here. Take the right fork that heads into a valley going south. Follow this narrow, but paved road 19.7 kilometer and go straight ahead at this point. Continue to kilometer 21.8, and make a sharp right turn here. If you had continued straight ahead, then you would soon see a pretty large dam above you. After turning, follow the main road as it climbs and gains elevation. 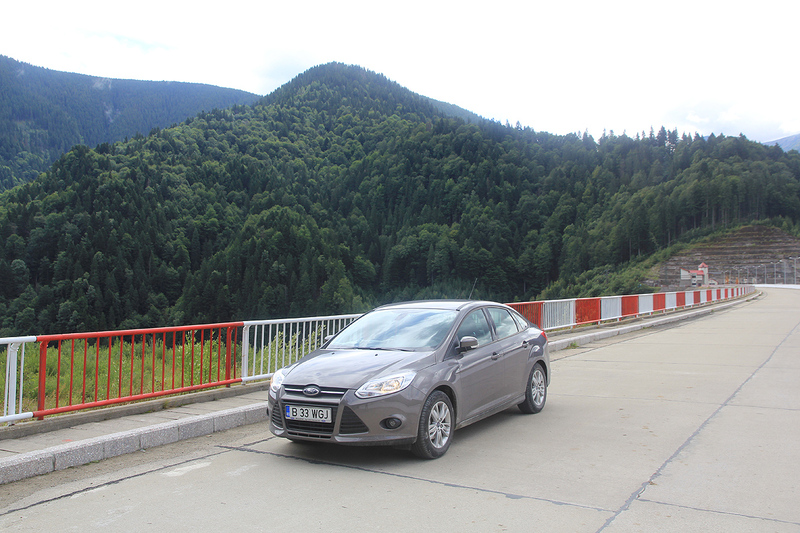 At kilometer 24.9 you have reached the top of the dam. At kilometer 25.9 you arrive at an iron barrier across the road. This is the entrance station to the national park. It is appearently served at all hours. In 2011, we paid 5 LEI per person, 7 LEI for the car and 30 (optional) LEI for a local map of the National Park. The road from here is rough. If you drive a high clearance (or even better, a 4WD) vehichle, you have made a good choice. 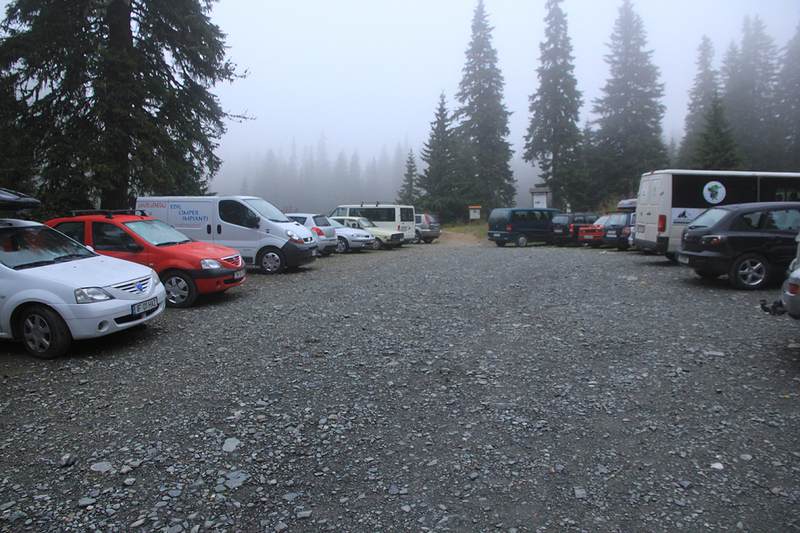 Still, when we were there, the largest number of cars at the final parking were quite ordinary passenger cars. At kilometer 29.3 the road goes left and at kilometer 31, one should keep right. At kilometer 37.7, we crossed a bridge in a rough part of the road and near kilometer 40.3, there is a sharp left curve that can be characterized as the crux of the road when we were there. The conditions and surface of this dirt road can change quickly and another spot could be rough at some different time. Finally, arrive at the parking lot when you reach kilometer 43.7. This is the trailhead, location N45:20.273, E022:53.608, elevation about 1600 meter. This road is reported to have variable standard. It was only marginally driveable (by a skilled driver!) for an ordinary passenger car in august 2011. Unless you have a 4WD vehicle, it may be advisable to call the national park and ask about the situation in advance, then have the trailhead directly from the north as a backup alternative. The national park has an information number: +40-254779968, that may be used. From the parking, proceed 25 meter uphill, then descend directly to the creek going left. 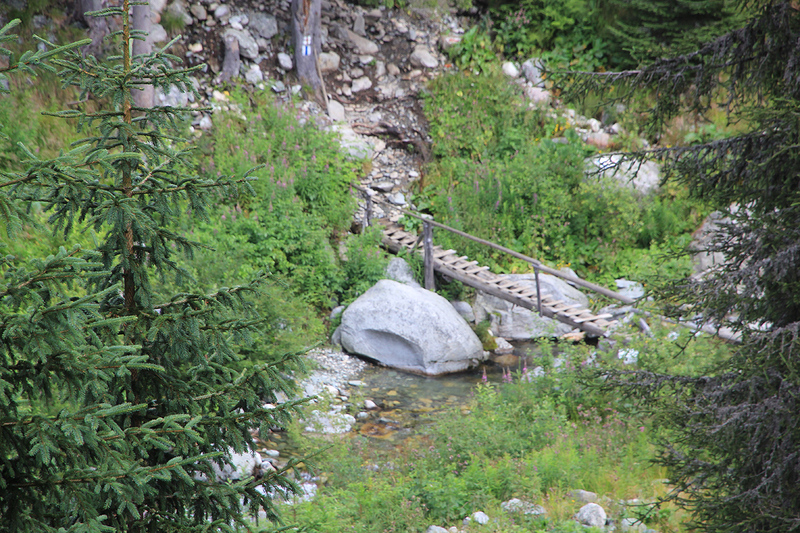 There is a long log bridge (with a handrail) that crosses the creek. After a short, but steep uphill the trail runs at the edge of open grassy fields further right. This area is the official spot for camping near this trailhead and normally there are many dozens of tents here in August. The small hut (not for hikers) is also located here. Continue along the big and also very well marked (A blue stripe on white, also a red cross) trail as it climbs gently staying more or less parallel to the a creek below on your left hand side. First through a section with big spruce trees, then a short section of dense pine brush (low entangled pines). 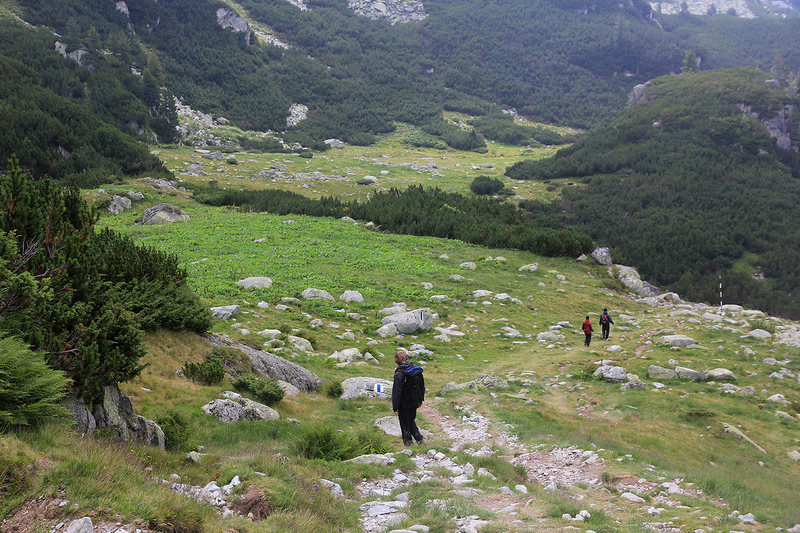 Finally, the trail breaks into open grass landscape as it climbs the last part to the south end of lake Bucura. 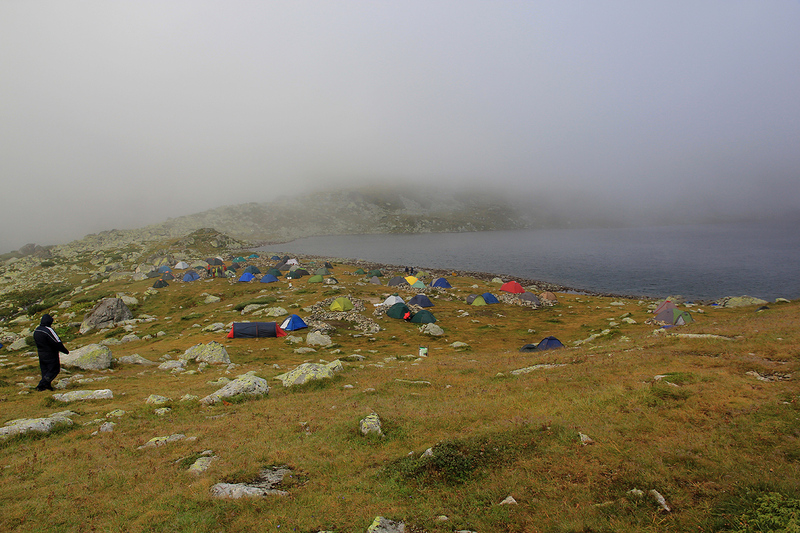 Lake Bucura is a very popular spot and there may have been as many as 100 tents there when we arrived. There is also a (red cross) refuge located near the shore slightly further ahead. Hike just beyond this refuge, you will then arrive at a signed trail junction with the right forking trail going to the summit of Peleaga. This trail is marked by yellow paint. Follow this trail to the summit. First, the trail sort of contours a bit left. Then there is a short, but steep section in order to gain the top of a distinct slope. Higher up, the slope is again more gentle, but there are more sections with rocks where the trail is hard to see except for the painted markers. Keep an eye on these markers in order not to loose the route. Pål and I had a good trip to Paringul Mare the day before, then drove over to this trailhead. We had no good directions and wasted quite a bit of time before finding the correct road to the dam, and in particular, to the top of the dam and the national park entrance. The road up to the trailhead was pretty rough in a few spots and it took us more than an hour to drive it without causing any harm to our car. We arrived just before dark, took our tent and gear across to the campground area, pitched our Bibler and tried to sleep. A very intense rain shower soaked the camping area during the night, but we woke up with no rain, lots of mist and with fog in all directions. We packed up camp and went back to the car with all overnight gear, then set out on the trail by 0645. The trail was nice and we had decided to only carry one backpack between the two of us today. We arrived at lake Bucara in one hour at 0745 and were quite impressed by the number of tents there. The fog was still dense, so not much to see besides the tents. We had a break and continued our hike around 0800. 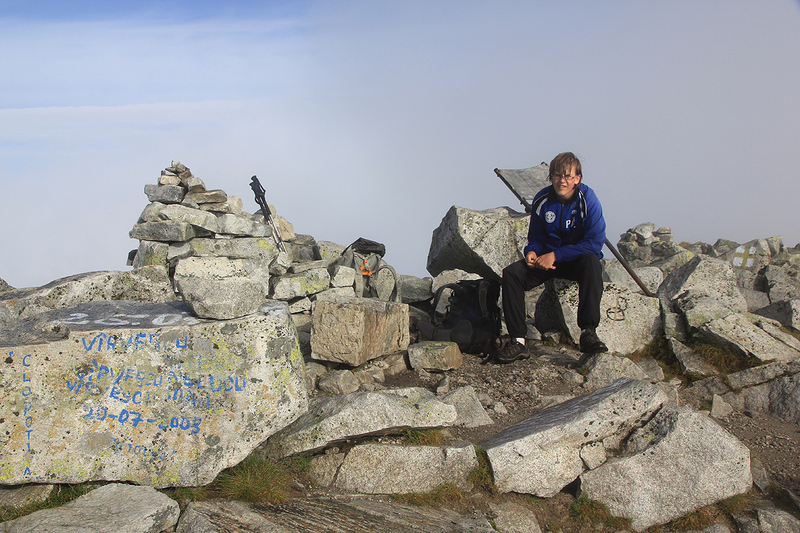 The ascent was easy and we made the summit in yet another hour, arriving there at 0900. Nicely, the summit was just above the clouds. 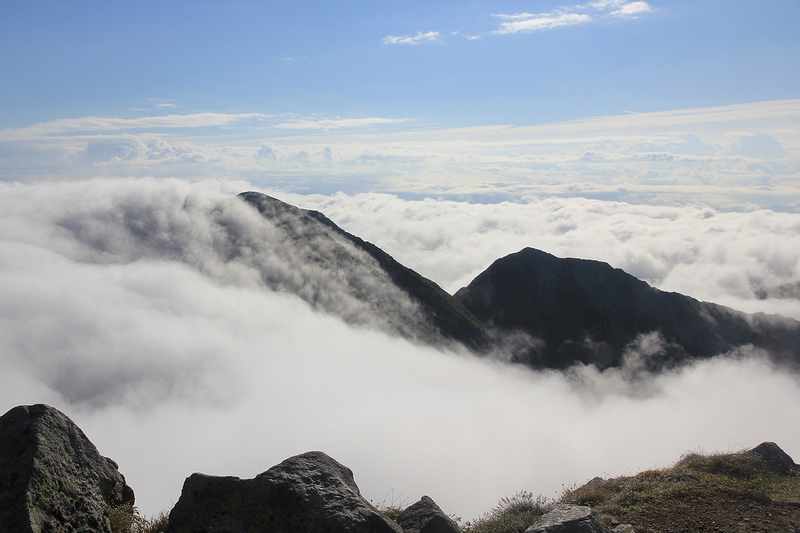 The clouds shifted and drifted a bit, sometimes our summit was the only point that could be seen above them, at other times we could see parts of other ridges and summits as they briefly came clear, then new shifts would put this out of view again. 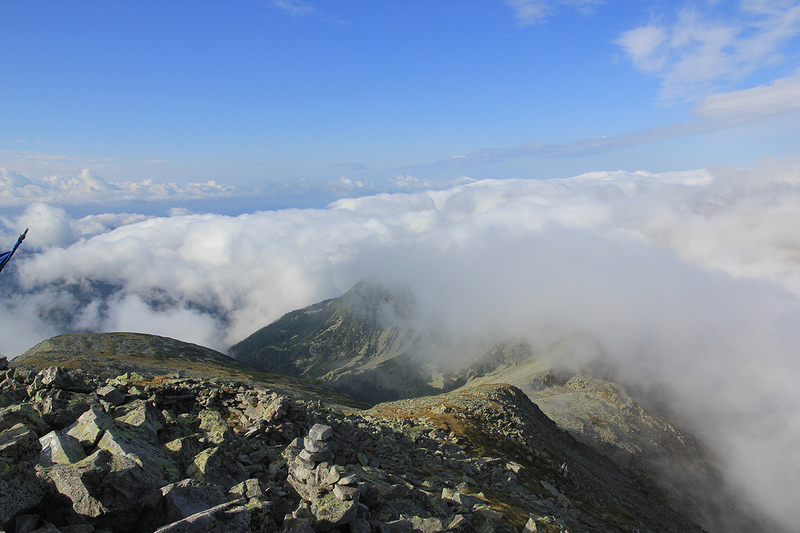 An interesting and constantly shifting scenery, cloudscape. We rested and enjoyed the summit until 0915, then desended leisurely back to the car in two hours, arriving there at 1115. We had intended to make this a circle route and traverse across to the slightly lower Papusa a short distance east, then continue the ridge south to Custura, before closing the loop, descending southwest along the ridge to a col and arriving back at the parking from the south, the entire loop being on marked paths. However, with dense fog and rain in the air, we decided to make this hike a bit shorter and rather aim for better weather on our two next mountains. 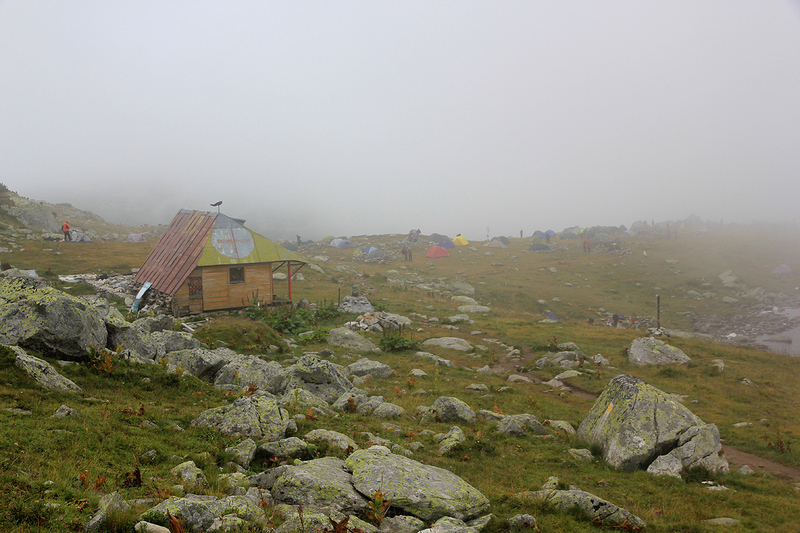 The red cross hut at Lake Bucura, this is returning from Peleaga. 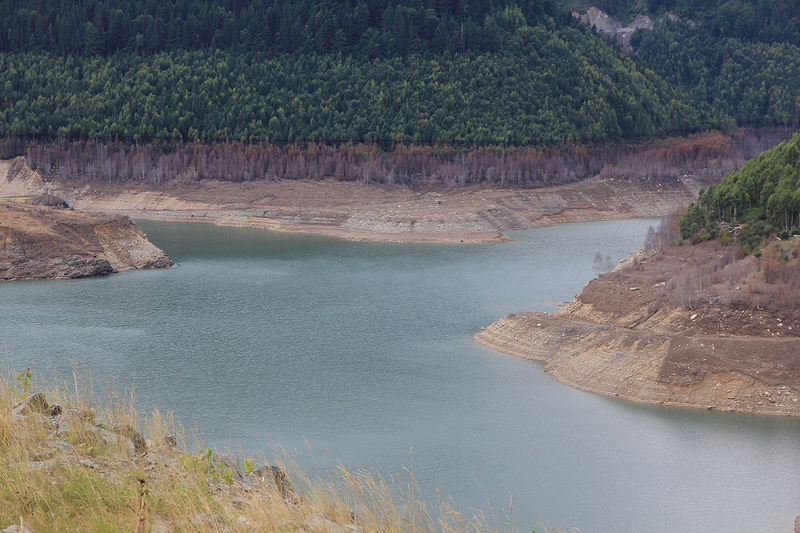 The reservoir was close to empty.